This spring we are offering yet again two brand new classes, one on Indy Media Production and the other on Institutional Racism in Grand Rapids. It is painfully clear from years of local news monitoring and analysis that there has been a decline in the level of journalism in West Michigan. The Indy Media Production class is being offered as an opportunity for people to learn independent journalism skills, media analysis and independent media production. For people wanting to be part of a growing movement of independent journalists, videographers, documentary makers, podcasters, zine makers or street media, then this class is for you. This GRIID Class will primarily be project focused, and the group will be asked to work together to create local Indy media. The nature of this media, the form that it takes, the audience it speaks to, and so on, will be determined by the group. We will do a brief intro looking at the state media locally and nationally before beginning on the project. The Indy Media Production class will take place on Mondays from 6 – 8pm, starting on Monday, April 8 and will last 7 weeks, ending on May 20. The second class we are offering, Institutional Racism in Grand Rapids, is an investigation into the function of institutional racism in Grand Rapids. 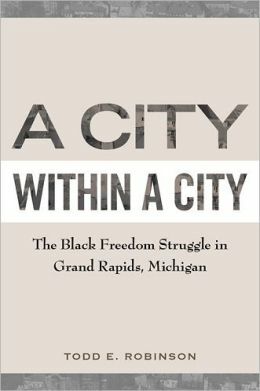 We will be reading the recently released book, A City Within a City: The Black Freedom Struggle in Grand Rapids, MI, which covers the period from WWII through the early 1970s. The author of this book, Todd Robinson, names the institutional racism in Grand Rapids as a form of managerial racism. In addition to using A City Within a City, we will investigate how institutional or managerial racism functions in Grand Rapids today, by looking at the economic, political and social condition of communities of color, as well as how White Supremacy is manifested in power structures. The Institutional Racism in Grand Rapids class will take place on Wednesdays, from 7 – 9pm, beginning April 10 and will last 7 weeks, ending on May 22nd. We are asking $20 for each class (does not include the cost of the book), but we will not turn anyone away for lack of funds. To sign up for either class, send an e-mail to jsmith@griid.org. Location for these class will be provided to those who sign up.